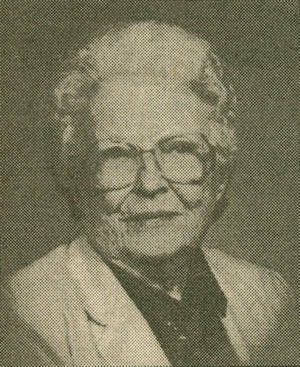 Obituary – Mugler, Maxine (Woodruff) « Perry High School Alumni Association, Inc.
﻿Basket Ball ’22, Glee Club ’21, Peroma ’23, Tennis ’20, ’21, F.F.F. ﻿Maxine Woodruff Mugler, 94, passed away Sunday, October 24, 1999 at her home in Perry. Graveside services will be held at 11 a.m. Wednesday, October 27, 1999 at Grace Hill Cemetery under the direction of Brown-Sisson Funeral Home in Perry. Rev. Ginny Hathaway will officiate. Mugler was born July 12, 1905 to Bradford Joseph and Effa Lee (Carlock) Woodruff in Perry. She married John Henry Mugler on December 22, 1929 in Perry. She was a graduate of Perry High School and the University of Oklahoma where she majored in history. She graduated from O.U. with a bachelor of arts degree in 1927, with a minor in sociology. Mugler taught history at the elementary school level. She was a member of the First United Methodist Church, where she taught Sunday School for 13 years and wrote a column for the church newsletter. While in college she was a member of Delta Delta Delta sorority; twice elected Queen of the May Festival and featured in the New York Times for that honor and as one of the first women to wear her hair in the newly fashionable straight bob. 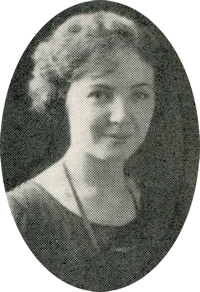 She was elected member at large and served as chairman of the Publications Board of the Oklahoma Daily. She was a long-time member and past president of the Ladies Tuesday Afternoon Club. Mugler was preceded in death by her parents; two brothers, Marsh and Raymond Woodruff; and her husband, John, who died December 18,1976. She is survived by two daughters and sons-in-law, Sally and Peyton Carnes, Wichita Falls, TX and Hayden and Chesley Wood, Austin, TX; a sister, Dorothy Ebersole, Perry; six grandchildren and their spouses, Lynn and Russ Pitts, Charlotte, NC, Leigh and Jim Bradburn, Wichita Falls, TX, Shannon and Greg Hagood and Millay Wood, Atlanta, GA, Matt and Teresa Carnes, Grapevine, TX and Drew and Teri Carnes, Bakersfield, CA; seven great-grandchildren, Jennifer Maneely, Ian and Kyle Bradburn, Matt and Will Hagood, Luke and Zachary Carnes; three nieces, Marsha and husband, John Dunn, Woodward, Lois Severe, Perry and Jenny Clark, North Carolina; a nephew, Sam Ebersole and wife Jeannie, Perry; and a good friend Doris Rodolph, Odessa, TX, formerly of Perry.